A ground breaking intercontinental collection of speculative stories, in both prose and graphic novel form, with contributors from India and Australia including Isobelle Carmody, Margo Lanagan, Nicki Greenberg and others of similar calibre. Be transported into dystopian cities and other worldly societies. Be amazed and beguiled by a nursery story with a reverse twist, a futuristic take on TV cooking shows, a playscript with tentacles, and more, much more. Plunge in and enjoy! A collection of science fiction and fantasy writing, including six graphic stories, showcasing twenty stellar writers and artists from India and Australia: Isobelle Carmody, Penni Russon, Justine Larbalestier, Margo Lanagan, Lily Mae Martin, Kuzhali Manickavel, Prabha Mallya, Annie Zaidi, Kate Constable, Vandana Singh, Mandy Ord, Priya Kuriyan, Manjula Padmanabhan, Samhita Arni, Alyssa Brugman, Nicki Greenberg and Amruta Patil. 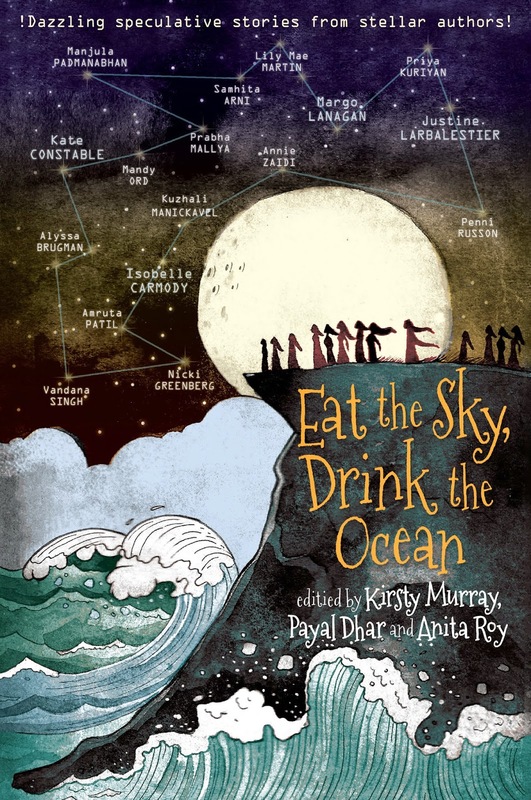 Eat The Sky, Drink The Ocean is a compilation of both whimsical and illustrated short stories from both Australian and Indian Authors that stemmed from the power of women all around the world. Each story is based on a dystopian alternate reality and range from the engaging and quirky, to the strange yet enthralling. From the Australian dystopian story by Justine Larbalestier, author of Razorhurst comes Little Red Suit. The storyline follows Poppy, a girl who lives underground after decades of drought. Now cities are nothing more than ruins, which Poppy will need to navigate to reach her grandmother's house. Taking inspiration from Little Red Riding Hood, it's unique and packs a real punch. I would love to see it developed into a full length novel. Each story wavers between dystopian, fantasy and magic realism, And although each are written by a different author, compliment each other beautifully. I loved the inclusion of the illustrated stories, but none more so than Swallow The Moon which is written and illustrated by Kate Constable and Priya Kuriyan. It tells the story of a community who now calls the forest home, where the young women make the long journey to the ocean, where they participate in a naming ceremony in the waters above a submerged civilization. A strong environmental message, it's powerful and beautifully illustrated. Cooking Time is a quirky take on the worldwide Masterchef. In a world where citizens are fed by nutrition packs, the show offers contestants the opportunity to travel back through time to locations all over the world, where fresh food was still available. Contestants are the envy of the nation. With seventeen incredible stories, including six beautifully illustrated from authors such as Kirsty Murray, Payal Dhar, Anita Roy, Samhita Arni, Alyssa Brugman, Isobelle Carmody, Kate Constable, Nicki Greenberg, Priya Kuriyan, Margo Lanagan, Justine Larbalestier and more. This compilation is the perfect gift for lovers of the written word. I loved it. Overall, it was incredibly engaging and charming and the transition from each story flowed beautifully from the selection of authors that complimented one another. One of the best young adult anthologies published. Oh, I want to read this! The only authors I've heard of/read before are Isobelle Carmody and Kate Constable but I love the sound of the theme of the anthology. It's cool how they've included some graphic/illustrated short stories as well. Definitely going to have to keep an eye out for that pretty cover in stores. Thanks for introducing me to this! It's absolutely glorious. I'm not usually a big fan of illustrated stories, but I was completely enamored with this book. My favourite story was actually Swallow The Moon, the first illustrated story. A strong environmental message and strong women. You mean Penguins the little waddling tuxedo wearing birds, or the publisher? It's lovely Alyssa, and such a celebration of females all around the world. I really want to read Eat the Sky, Drink the Ocean now. I'm not usually a fan of anthologies, but this one seems especially interesting. A beautiful expression of feminism through speculative story lenses? Yes, please! The cover is also gorgeous, which is always a plus. I'm not usually either, because there always seems to be only one or two fantastic stories and the others generally fall flat. Not this one though, they were all between three and five star reads, most being four stars. It was just lovely. This sounds amazing, I haven’t read to many anthologies but I’ve always wanted to read more. Why is it every time I look at your blog Kelly I see my wallet get thinner you always make me want to buy all the books. It’s a hard life loving everything. Great review as always home gurl! I'm the same with your reviews, having similar tastes in books, I should just add everything to my list that you've added, saves time that way. Anyway like I was saying, I am really curious about this one! I really wanna read more magical realism this year so this seems like a great place to start. It's truly lovely poppet, especially the illustrated stories. The stories are pretty short, but some of them pack a real punch, others are just so whimsical. I can't wait to see what you think of it. This one sounds interesting!I love short story anthologies,but unfortunately haven't read much. The cover is so beautiful,by the way. It's absolutely divine Mishma! The cover will draw you in, but the stories are fabulous. It's girl power at it's finest. It's so incredibly lovely. I'm not usually either Kara, but I just couldn't resist this one. This sound . . . beautiful. Truly. And so captivating. I bet the illustrations are insane! Captivating is the perfect work to describe it. It truly is. The illustrations are dramatic, bold and I honestly fell madly in love with them. It's by far the best anthology I've read so far. I usually don't read anthologies but I may just have to give this one a try, it sounds gorgeous (and looks gorgeous too) The illustrations sound really intriguing too, that would be a new experience for me. I'm unfamiliar with the authors but it's a great introduction! Me either Elise, but seeing it was from multiple authors in both Australia and India, it promised to be something special. It certainly delivered too. I've been lucky enough to have read a few of these authors previous work, and this is just as, if not even more engaging. And that cover is just delicious! Oh, also this book? Yes, yes, I would love to read this book. I was tempted to request it buuuut I never really read short stories so I wasn't sure if I would like it or not. BUT I WANT TO TRY. IT sounds incredible. I'm surprised you remember who I am. Where have you been? I've felt so unloved, dropped by the smushie and have been crying myself to sleep every night. I don't usually either, anthologies and I just don't click... Until now. The premise was too good to refuse. Women authors celebrating female characters with messages of unity, hope and kick assery. It was brilliant. My thoughts exactly Eugenia. And even though each author was unique, the stories blended together so well. It was just lovely. I really want to read this anthology. I love anthologies and this sounds like a must read. I'm really looking forward to the illustrated stories, I love pictures in my books :) So glad to hear you enjoyed this one. Great review. The illustrated stories added such a whimsical quality to the anthology, I think you'll absolutely adore this one too Rochelle. Huh. I didn't know this was an anthology! :) COOL!!! What a lot of authors! The authors in this one are all brilliant Renee. All unique, but they really compliment one another too. You need a copy of this one, it's fantastic! Ahhhhhhhhhh I want to live in Australia right about now. That book sounds amazing. I LOVE retellings. GREAT review. I'm generally not a fan of anthologies, but this sounds super cool. I read Eugenia's review a few days back and it definitely made me more interested...after reading your review, Kel, I NEED THIS BOOK. It's such a beauty to look at, also.